Now in their fifth year of cross-state existence, The Junes are launching their new CD 12 Golden Greats into the hearts, minds and souls of roots music lovers across the universe. With poetic precision, the month of June will provide the wintery backdrop for the group which categorically states that “Country IS cool!” as they meander through regional Victoria and NSW, Melbourne, Wollongong and Sydney. This is no simple task, as the members of the band hail from as far afield as Melbourne, The Bellarine Peninsula and Newcastle NSW. But this geographic challenge only adds to the diversity of musical influences, lyrical content and poise which characterises any show by The Junes. FEATURING the soulful power of Suzannah Espie (GIT), the earthy nurture of Sarah Carroll (GIT) and rural roots of Gleny Rae Virus (Toe Sucking Cowgirls), the combined effect of these stellar performers brings the planets into alignment, opens the blooms of rare flowers and casts a mesmerising mist over their audience. All three women have successful solo careers and diverging music influences, so the combination is truly greater than a sum of the parts. 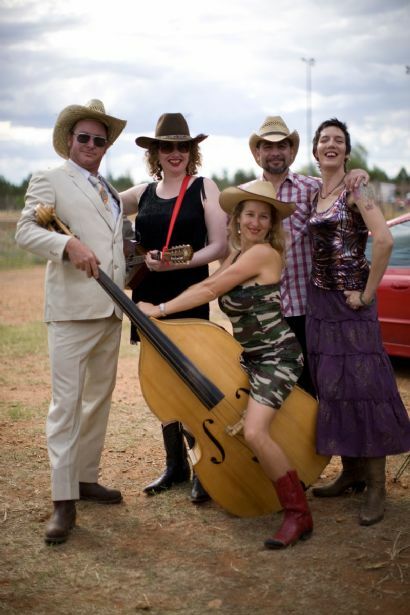 Behind every great woman there is a patient man, and the front ladies of The Junes are ably accompanied by their well manicured backline Chris Tabone (Abbie Dobson, Renee Geyer) on skins and percussion, and Dougie Bull (The Lairs, The Lawnmowers) on bullfiddle and bawdy gags. Wielding guitars, fiddle, mandolin, ukulele and even the diabolical piano accordion, The Junes deftly weave a broad range of musical influences from calypso, soul, gypsy, 70s rock, folk and roots country swing. “How do they do it?” I hear you ask. It requires a deep love of music, an ocean of humour, a river of emails, a whole lot of time on the blacktop and the patience of Saint Cecilia, particularly for Sarah and Suzannah as they sagaciously nurture motherhood roles. The Junes earned a guest appearance on the consistently popular music quiz, Spicks and Specks in June 2008, were finalists in the Victorian Country Music Awards Best Band for 2009 and finished in the top ten for 2009 Australian Songwriting Awards Best Country Song, making them one of Australia’s top “almost award winning” bands! In 2009, their magical cone of cool country hypnotised punters at Apollo Bay Festival, Port Fairy Folk Festival, Blue Water Country Music Festival, Katherine Country Music Muster, Queenscliff Music Festival, Dorrigo Bluegrass Festival, and many remote students on the black soil plains of the Darling River region. This year has been just as productive, with The Junes inaugural appearance at the Tamworth Country Music Festival and the Mossvale Festival (Vic). The band hopes to return to western NSW for more school workshops and performances designed to inspire and motivate young people towards musical projects. The new album 12 Golden Greats was recorded in 2009 at Audrey Studios with Craig Pilkington (Gurrumul Yunupingu, Weddings Parties Anything) working his magic at the mixing desk and also producing in conjunction with The Junes. The result is an incredible musical journey between old and new; a magic carpet ride woven from threads of old LPs and western lullabies, glitter from an 80’s disco outfit and lots of soft floral patterns collected from every op shop on the east coast! Influences shine through like rhinestones on a Nudie suit; The Andrews Sisters, Lucinda Williams, Riders in the Sky, Time Jumpers, calypsonian Lord Kitchener, June Carter-Cash. Yet the result is as fresh as the first shower in spring, polishing our treasured musical gems into a brand new jewel. You are not currently logged in. If you are already a member, please do so. You have to love the gumption of The Junes in naming a new album of original songs "12 Golden Greats". But you gotta back yourself, huh?